450cm wide displays are made by using three Twinbase XLs to support one very wide graphic. The fabric graphic is not in sections, printed in one piece and therefore totally seamless 9m2 of print. This display has two flexible joints which allow the display to be used straight or angled as you wish. It helps too when folding the display away for transportation and storage. In this case, the graphic is folded in a Z-shape down to 1.5m before rolling away. 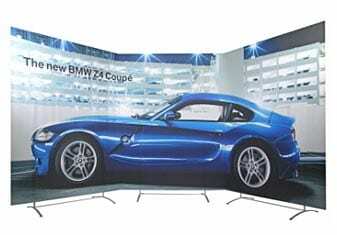 These displays are still lightweight and make an ideal portable backdrop for any situation. 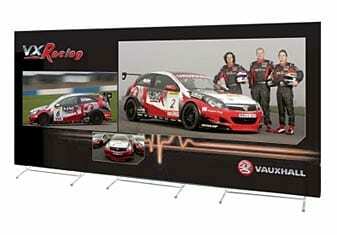 They are often used for showrooms, events or as an exhibition stand back wall. 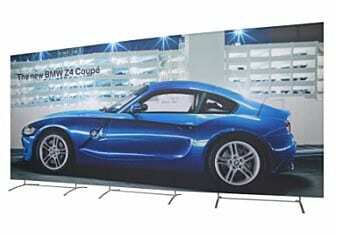 The FLEX-display Backdrop 450 system is very lightweight, especially when compared to a pop-up display for example. 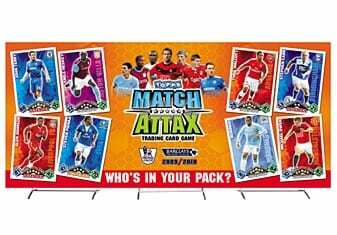 Using dye sublimation printed polyester fabric supported by aluminium hardware the 4.5m x 2m backdrop seen above weighs in at approximately 11kgs including carry cases. The whole system fits neatly into two carry cases measuring 160cm in length by approx 10cm diameter and one measuring 135cm in length of the same style and diameter. As the graphic is independent of the vertical poles and bases, it is simple to change. The system can also be made double sided too but only if straight (not angled) by using a different clip set and adding a second fabric graphic with rails to the rear of the display. 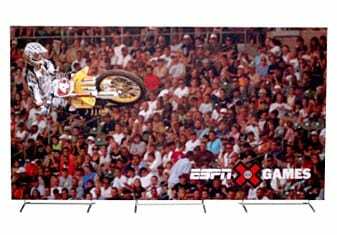 As we are using 3 x Twinbase XLs with this display, it is easy to use them independently by just having smaller graphics with rails to create to separate banner stands. Although this stand is very large, assembly is still very straight forward but requires 2 people to connect the graphic ideally. 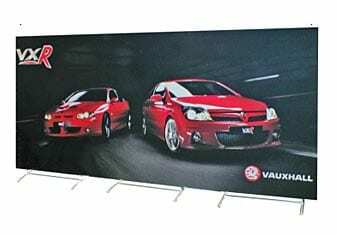 The display comprises bases, poles, clip set and fabric graphic. Like all of our displays, the components are modular and designed for easy push fit assembly. Building this stand hardware is just as easy as building up one of our smaller displays as it works in the same way.